Although the Algarve has a Mediterranean climate in common with those countries that surround the basin of the Mediterranean sea, the fact that the ocean that laps at its shores is the Atlantic and not the Mediterranean, gives it a number of advantages which benefit both the people who live in or visit the Algarve, and also makes its coasts much richer in wildlife diversity and species. The temperature of the Atlantic remains cooler throughout the summer than the Mediterranean, a fact that frequently takes beach visitors by surprise when they rush into the sea to cool down when subathing - it can be a truly chilling experience! The Mediterranean is a small sea in comparison with many of the vast oceans in the world, and because of this it has a much reduced tidal range meaning that the coastal waters are not 'refreshed' to the same extent that they are in other regions. The Algarve coast, on the other hand, has the benefit of the tidal range of the Atlantic Ocean, and this means that the beaches and estuaries are richer in wildlife, particularly in invertebrate species, making it a much more attractive place for birds, such as waders, that depend on food-rich intertidal zones for their survival. 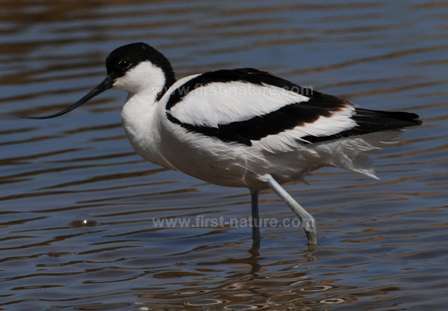 Various parts of the Algarve coast are real hotspots for seeing migrant birds which take shelter from stormy weather, and the rich estuaries, mudflats and salt pans mean that they can rest and recuperate for several days before continuing on their spring and autumn journeys. One of the great birdwatching sights of the Algarve are the flocks of Greater Flamingos that can be seen in the brackish lagoons and saltpans close to the coast. Some of them nest in the Algarve while others travel on to the Camargue in France. Good places to see them are at Castro Marim Nature Reserve and at the estuary at Alvor. They can also frequently be seen from the bridge over the Arade River at Portimao on the N125 road. 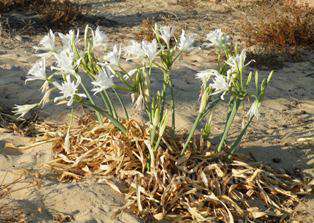 The Sea Daffodil flowers on Algarve beaches in the height of summer. The fabulous white, sandy beaches of the Algarve are particularly benign for visitors, and the wonderfully warm climate makes them a world class destination for sun-worshippers from May right through to the end of October. Winter walks can be a delight, too. Days without sun in this part of Europe are few and far between even in the depths of winter and make the occasional cold winds tolerable except on the stormiest of days. These beaches are a far less hospitable place for plantlife, but despite that, there are a surprising number of plants that have adapted to live in these salty and windswept areas. A notable species is the beautiful Sea Daffodil (Pancratium maritimum) which is also one of the latest of the Algarve plants to come into bloom. It's lovely white flowers appear in the height of summer when the rest of the Algarve landscape (especially the coast) has turned brown as the spring flowers die back and go into their dormant period. Another stunning plant which grows in sand, and flowers much earlier in the year is the broomrape, Cistanche phelypaea. Not only has this amazing plant evolved to withstand the tough coastal conditions, it is also a parasite, gaining some of its nutrients from another tough and similarly adapted coastal plant, Goosefoot - a member of the Chenopodiaceae family. Cistanche phelypaea erupts from the ground in March, and at first glance the flower spikes resemble giant, bronze asparagus tips. In April the spike is transformed as the massive, waxy yellow flowers open. There are particularly fine specimens of this plant at Parque Natural da Ria Formosa and they can be found intermittently along the coast where there are beaches. 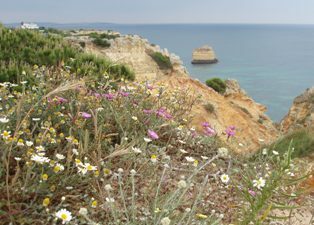 Walks along the Algarve clifftops in spring can be extremely rewarding for the plant lovers among us. Not only are the coastal views spectacular but many of the Algarve's wild orchid species grow among the shrub and thyme brush which thrives there. The sandy soil is host to numerous other species of delightful and brightly coloured wildflowers, and of course, the flowers are a major attraction for many of the lovely butterflies and moths of the region as well as a whole host of other brightly coloured bugs and beetles. The clifftop soils are very thin and dry out very quickly in the hot sun which is often accompanied by sea breezes. Few trees can survive these tough conditions but one that thrives there is the Stone, or Umbrella, Pine. Not only are these trees grown for their stabilising influence in the sandy and inhospitable coastal land and sand dunes, they are even more valued for their pine nuts which make such a delicious addition to salads and other dishes, especially when toasted. The best known and most spectacular of the Algarve's cliffs are at Cape St. Vincent, the most south-westerly tip of Europe. Not only are the cliffs themselves magnificent, but the flora at the Cape is internationally renowned. Once spring gets underway the clifftops are smothered in pincushions of brightly flowering low-growing plants. This is a sight not to be missed in any circumstances if you are in the Algarve in April or May. This wonderworld of flowers is home to the Wild Snapdragon from which our much-loved cultivars were developed, along with numerous other beautiful species. There is so much more to enjoy about the coast than simply lying on the beach, and those who take a break from the sunbathing to go for a walk, even a short distance from the beach, are likely to be rewarded with some close encounters with some of the Algarve's most interesting and captivating wildlife species.